Originally published and copyright 1983. C-RA Vol VI #3. Unauthorized duplication or use is prohibited and in violation of international copyright law. The archaic calendars of the Eastern Slavs, including Carpatho-Rusyns were neither stabilized nor unified. "New Year" usually began in March or September, and years were counted from "the creation of the universe" or some other hypothetical beginning. The acceptance of Christianity from Byzantium led also to the acceptance of the Julian calendar established by the Roman emperor Julius Caesar in 46 B.C. according to which every fourth year was a leap year with 366 days, i.e., a year in which February had 29 days. This date differed every year by 11 minutes and 14 seconds in excess of the astronomic calendar, and as a result in excess of 1 day every 128 years. This fact led Pope Gregory XIII in 1582 to reform the Julian calendar by abolishing the leap years falling on each respective 128th year. Since there were 10 such years preceding the pope's reform, he ordered that initially October 4, 1582 be followed by October 15. This reform was binding for the Roman Catholic Church, but other churches, including the Orthodox Church, either did not accept this reform, or did so considerably later. The Gregorian reform was not accepted by the Greek Catholic Church in western Ukraine or in Subcarpathian Rus' (Transcarpathia), even after establishing its union with the Roman Catholic Church; nor was it accepted at first by the newly founded Orthodox and Greek Catholic parishes in the Americas, with the exception of Argentina, Brazil, and Paraguay where the Gregorian calendar was proclaimed universally mandatory in 1939. As a result, all traditional church holidays celebrated by members of both the Orthodox and Greek Catholic churches "lagged behind" holidays celebrated by Roman Catholics by 13 days. (Easter and other moveable feasts are celebrated according to the lunar calendar.) Even though church authorities in Transcarpathia, as well as in the United States and Canada, have today no objections against the transfer to the Gregorian calendar, most parishes, especially in the countryside, follow the traditional "old style" calendar. It is to be emphasized that until the twentieth century the official calendar was virtually of no great significance in the everyday life of Carpatho-Rusyns. The common folk marked years rather in terms of memorable historical events (wars, natural disasters, epidemics), and months and days according to the departure or arrival of migratory birds, the beginning of agricultural seasons (koly jarci sijaly; koly zita zalyl when they sowed the barley; when they harvested the rye), or according to Christian holidays (na Matku Bizu; na Velykden' at the Feast of the Assumption; at Easter). Until quite recently, it was common to find among the elderly that they were not aware of the exact date of their birth. As a consequence, the celebration of New Year is not connected with any particularly rich complex of customs. Jak jasnyj, Misjac mezy zirkamy. Like a bright moon among the stars. Some other of these New Year wishes were "transplants" of wishes from the Christmas period. 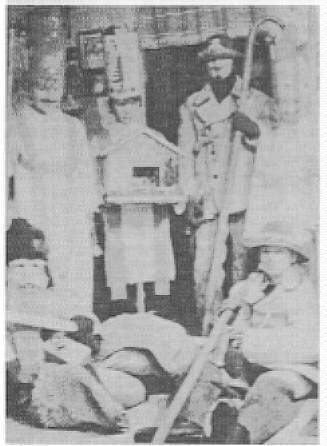 Nativity players from the village of Kurov, near Bardejov, Presov Region (photographed by the author, 1983). Jak pride Novyj rik de sja podijete? A ja, nebozatko, nemam raz ku komu. And where are you to go when the New Year comes? In the distant past, the beginning of a new year was identified with the central event of the winter solstice, the Yuletide (Rirdvo, Hody). It was a feast directed at the safeguarding of the new crop. Its original magical function, connected with agriculture, is still prominent in many customs today. One of the ancient customs required that on Christmas Eve the husbandman (gazda) nurse his fruit trees by bandaging them with straw binders and treating them as living beings. The tree which did not bear fruit was warned by the husbandman holding his axe: Jablin', jablin': zarod' jabka; jak ne vrodys, vyrublju tja (Appletree, appletree, you shall bear fruit, or else I will cut you down). It was believed that such a tree would take the threat seriously and would start bearing fruit. In another custom, the feed for hens and other poultry was put into a hoop or a chain shaped into a closed circle with the belief that the poultry would not then go astray into the fields. Cattle were chased across a brook to prevent them from limping in the summer. They were further protected from the supposed bad influence of witches by being fed thornbush hips (sverbohuzkyi). Also, nothing in the house could be lent out on that day so that good fortune would not leave the house. Linen could not be hung around, for throughout the year it was usual to hang the skins of dead cattle around in a similar manner. The windle (motovidlo), an appliance for winding yarn, was to be left empty to prevent poverty from "winding" around the house, while the distaff was to be full so that the house would be full of prosperity, and so on. Most magic customs were connected with Christmas Eve (Svjatyj vecur, Korocun, Vilija). On that day the husbandman covered the floor with straw. An unthreshed grain sheaf, usually oats (called in some localities "Didko" or "Diduch"), was placed on the honorable seat at the table, i.e., "into the corner" under the icons. According to historical and ethnographic literature, in the archaic Slavic homes one corner was reserved for a representation of the pagan gods. Oats or straw were also used for decorating the festive table on which there had to be seeds from all crops. In the spring these very seeds were used in the first sowing. The oats and straw had a magical function in pagan society: they were expected to secure plenty of fodder and grain. Christianity provided another rationalization for the custom, stressing the birth of Jesus on straw and oats, thus transforming the two into symbols of that event. Also placed in the place of honor was the festive bread (korocun, kracun) decorated with wintergreen or periwinkle (barvinok) and various small figures. Prosperity was symbolized by a "mountain" of bread at the end of the table. At the beginning of the evening meal the husbandman hid behind this "mountain," asking: "Can you see me from behind the bread mountain?" The children replied in a chorus: "We can't," after which the husbandman concluded: "Let us wish you'll not see me either in the spring from within the hay or in the summer from within the wheat!" 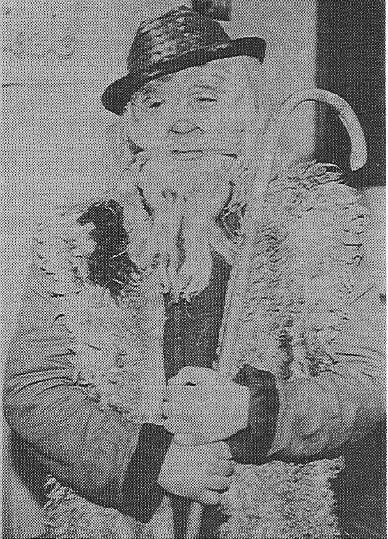 The Dido character from a nativity play in the village of Certizne, near Medzilaborce, Presov Region (photographed by the author, 1972). When the first morning star was up, the whole family hurried to wash in a cold brook. They believed that the bath had a magical purgative function and that it would help them to maintain good health throughout the year. The last to leave the brook was the husbandman's wife bringing with her a pot of water into which the family put bits from each dish of the evening meal in order to feed the cattle later. After returning from the brook, the husbandman stated his good wishes for the family: "abundant crops in the fields, new offspring at home, expansion of the homestead, satisfaction from children, kindness from the overlords, respect from fellows, as many heifers as there are firs in the wood, as many bulls as there are beeches in the forest," etc. After a common prayer, candles were lit on the table and all took their seats at the Christmas Eve table which no one could leave during the evening meal. Under the table they Many magical superstitions were also connected with other days of Christmas. It was generally believed that as of midnight on Christ's nativity day water changes into wine and that at this hour cattle can speak like people. Ona vam bude jisty davaty. At present, the Christmas customs are rather simplified. What has disappeared are especially the magical rites aimed at improving the crops or ensuring prosperity. Even though they may still be carried on here and there, their function is largely entertaining.